By combining skincare therapies it is possible to perform a “liquid face lift”. Prices start at around £500 and the precise treatments and order in which to perform them will be discussed and fully explained at the start of treatment course. The beauty of the liquid facelift is that treatments can be paid for, and timed to the convenience of the patient, and changes can be as gradual or dramatic as patient prefers. 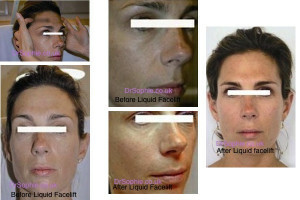 The two series of pictures demonstrate the dramatic results that can be achieved with a liquid facelift. However in both series a number of treatments were done over many months. In the first series the patient was initially sceptical about “Botox®” and “Fillers” and was keen to start with less dramatic “Peels” and “mesotherapy/skin boosting” over a number of treatments she could see a good result and eventually felt more at ease, with having more dramatic treatments with “Botox®”/anti wrinkle injections and “Dermal Fillers” which as you can see produce an excellent end result. The second series the patient has had a combination of skincare treatments, but as she was happy to consider most treatment options at the start, higher impact treatments could be used. This result was obtained in relatively few skincare treatments over a number of weeks. In order to achieve natural looking results less is more, minimum amount of “Dermal Fillers” often needs to be used to achieve maximum effect, it is therefore often better to wait 2 weeks in between Botox® and other treatments, in order for the Botox® to take optimal effect, the result of this is that ultimately less product would be used. This not only achieves a better end result for the patient but is also more cost effective. All of these things need to be carefully considered, for example if you want to look your best for a big day eg a wedding it is optimal to start liquid facelift treatments at least a couple of months before your big day.